But we're resilient Coloradans, so we pick ourselves up and dye Easter eggs. And we brush the snow off of tender tulips and daffodils for Easter Sunday. Where no one wears pretty spring dresses but instead cobbles together weird tights-slash-bright-color-sweaters-slash-maybe-sandals. It's very awkward and very Colorado. Help! It's not supposed to be like this! Everything Is Awkward: Easter Sunday, 2016. Note the leggings, sweaters and long sleeves. As a Southerner, I believe in the right to wear springy fashions to church on Easter. This cannot be done without a maximum of weirdness in Colorado. Luckily, today I write this blog post and it's deliciously balmy outside, something like an insane 70 degrees. It's almost time to bring out the lawn mower and think about planting something. What about your neck of the woods? Warm and sunny, I hope? This year definitely has a different feel to it. We're less rushed, less stressed and more peaceful. How is that, you say? TELL ME MORE. Okay, I will. Here goes. One major theme is that we've been better with managing our money. We have almost one year of You Need a Budget under our belts. This budgeting software has been life-changing. 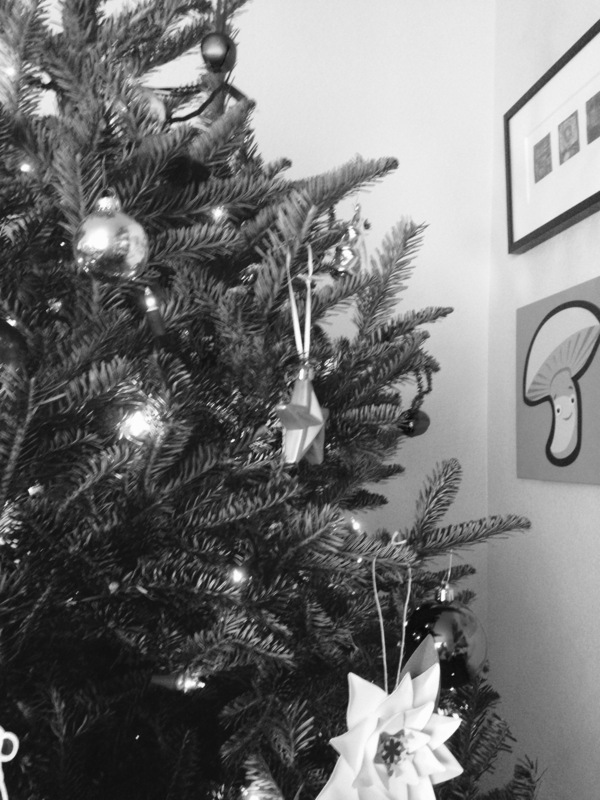 Instead of stressing about holiday expenses, we saved throughout the year for presents, the tree and even our Christmas cards. Yeah, baby! We also said no to some crazy-making things that we just didn't need to do because we were invited. I have been shopping online, too, with the budgeted present money (easier than shopping in a store!). I also reviewed the next six months of plans and dreams our family has and scratched out some quick dates and budgets (Go ahead and say it: I am a complete financial nerd.) This exercise (oddly) has made me realize that the month of December will be followed with the Rest of Our Lives. One month does not a Happy Family make. We still have to wake up and do it all again come January 1. We will also see my beloved brother and his family for Christmas, and this makes my heart sing. So, I've been thinking about that visit and how happy we will all be. Lots of wine and great dinners. Cousins playing and romping. It's going to be AWESOME. And I am grateful. Grateful for these small moments, like when my 3-year-old asks if TODAY is Christmas. She's always sure it is. Or when we light the Advent yule log and the older girls squeal because now we're lighting two candles...not just one...which means Christmas is SO close. Yeah, so I'm grateful in general. And I am grateful for the meaning of Christmas. Here are some snaps of the ole Homestead, below. Nothing is neat; nothing is perfect. It's okay. I need to go back and tell twenty-year-old Jen this. We figure everything out. Eventually. Happy Hanukkah to our Jewish friends! And a warm Merry Christmas to all. Thanks for stopping by our blog. Today, Dear Reader, enjoy this roundup of February in the life of two writers/one artist/illustrator/video scribe who are keeping it together with duct tape and just a teensy bit of coffee. First up, and most excitedly, we have SECRET NEWS to share. There is a book. A picture book by Jonathan. To be published by a FANTASTIC new publishing house friend. A WONDERFUL editor. A great STORY and ILLUSTRATIONS. But until the contract is signed and the ink is dried, I can only be VAGUE and ANNOYING. Sorry 'bout that! Traveling for a husband and father of three young, howling girls is like a vacation, Jonathan tells us. And I (Jennifer) can agree. At the end of last year, I traveled out to Burbank, CA for a few meetings with the fab startup where I am a content consultant. Beautiful hotel? Nice meals in cool restaurants that aren't Chick-Fil-A? No one saying,"Are you awake, Mom? It's 5:05 a.m." Yes, please! Jonathan also continues to do drawing and painting commissions. He doesn't paint for galleries anymore, but he certainly always has one or more canvases in the wings. 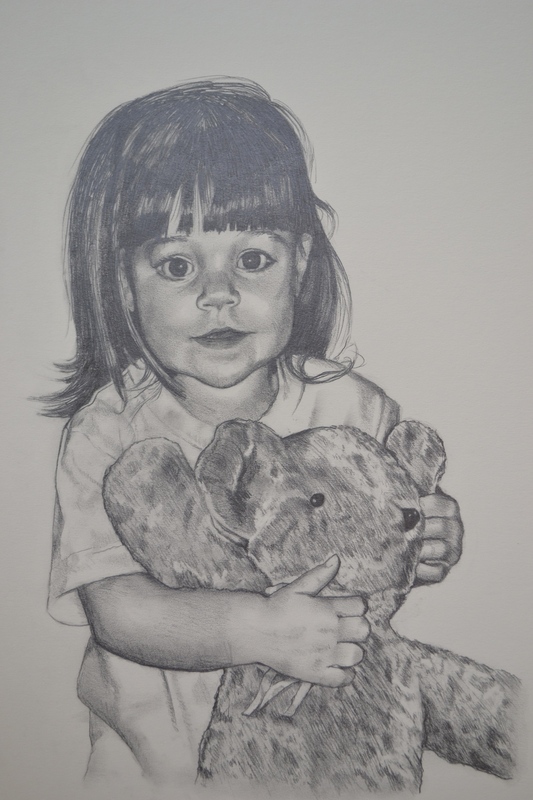 This is a drawing for a client of his daughter when she was young. There was another drawing (by a different artist) of the client's son. So, now they have a matching pair. The client was so pleased, he commissioned Jonathan to do a painting of the kids who are now older children/teens. During February, Jonathan also finished up another children's book that his fabulous agent, Carrie Hannigan, has making the rounds. Hopefully good news to come, soon! One of Jonathan's character design clients, 3W Races, makes the BEST race medals, tees and ribbons. 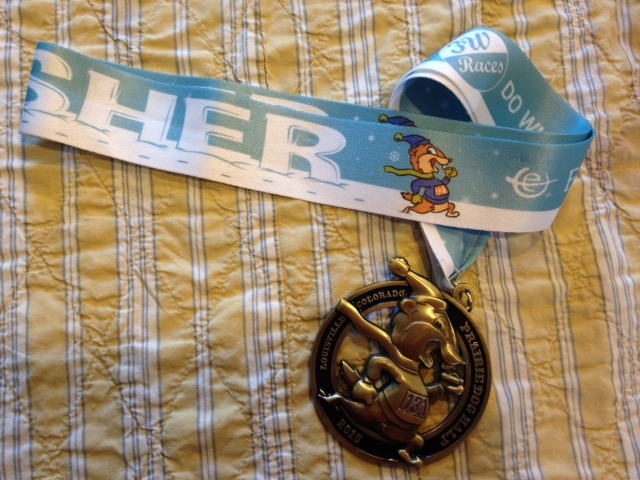 Here's a recent project Jonathan did for 3W's Prairie Dog Half Marathon series. He designed the ribbon with PeeDee, the mascot (that he also created for 3W). If you were a runner, wouldn't you love this custom medal rather than the generic "foot and wing" medal? If you dig PeeDee, you can visit 3W's store, here, and suit up. I think that's about it! We also took the show on the road last week, visiting family in New Mexico. Jennifer wrote each morning for her work and Jonathan watched the little darlings. Now that we're back home, it's crunch time to get some projects turned in. Stay tuned and thanks for stopping by. We're Jennifer and Jonathan Fenske, creators of FatandAppy.com. Jonathan is the author/illustrator of Woodward and McTwee (Penguin USA), among other books. Jennifer blogs about faith and life at ThePenzy.com. I redid this room a few months ago, but I could never get really good pictures, so I put off writing about it. I still don't have great snaps (sorry! ), so I'm just going to throw it out there. Ya'll are crazy understanding and super supportive, so I think it will be okay. Let's dive in! Here is what we were dealing with: a combination guest room with queen bed and nursery space + crib for our third daughter. (Third kids don't get fancy nurseries....life IS unfair, I know.) We had the green wall color for about six years and I was over it. I had replaced the duvet cover with a Target sale duvet cover but it really wasn't the right choice. It was high time for a redo...something that our little girl could grow into when the crib was removed and she would sleep in the big bed. I usually start with a color "feeling" and in this case, I wanted strong, intense colors like aqua, raspberry and perhaps yellow. But in recent years, I have been dialing back the saturated wall colors in favor of more neutral tones. (I did this with our family room makeover last summer. Gray was the word of the day.). So, I decided in this room, I would go for a neutral wall and then turn up the volume on the bed covering and the accessories. I went with "Pink Cadillac" by Benjamin Moore color-matched to Valspar Ultra No VOC on the walls. This delicate paint is almost cream with a hint of pink. I love it and it gives the room a warmth that was unexpected. Jonathan painted the butterflies on the wall. I have seen a lot of 3D paper butterflies tacked onto girls' walls on Pinterest, but I have to admit that my girls are rough. They would tear down paper thingies in seconds. Plus, I figured I would be forever sticking butterflies back on the wall once the adhesive wore off. So, I asked Jonathan to paint some butterflies and he agreed. Love my man! The art is from Michael Mabry and it's actually cover art from Land of Nod catalogs. Michael designed LoN catalogue cover art for about ten years, Google tells me. We found these beautiful, professionally framed prints in a thrift store for $10 each. The curtains are pretty polka-dot cotton panels that we had in the linen closet from our last house. I love reusing things and it saves money! 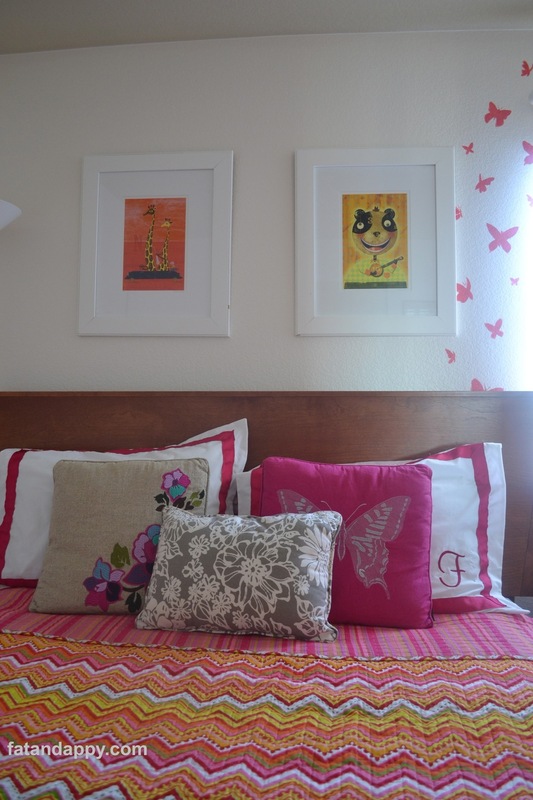 The quilt coverlet (Overstock.com) really set the tone for me to jazz up the room with fun pillows and art. The monogrammed pillows are from my friend Laura's Etsy store, which she has since closed. The gray pillow is from HomeGoods and the flower and butterfly pillows are MudPuppy from Target.com. I was able to add a pop of yellow color with the lampshade (Threshold from Target) which we simply affixed to an ancient Martha Stewart lamp base we have had forever. The art is from my middle daughter and is framed with a Target frame. Chair is vintage. Jonathan painted the Fisher Price race car above the BabyMod crib. You can purchase a canvas print of the car on our Fat and Appy store. The rug is from Angela Adams--we have had two of them for a long time. That's it! The room is bright, cheerful and has a young sophistication that will grow with our sweet babe. Plus, we can still host overnight guests (and the baby can bunk with us). If you liked this post, you might enjoy the True Tale of the Millionaire's Chandelier, stuff you can decorate with for just $6 and our Family Room Makeover. Jonathan just shipped out another commission to a favorite client (oops, can I say that?). She has commissioned two other paintings, "The Things We Leave Behind" and "Working Well Together." The latest painting is definitely one of my favorites. "Life Is Built of Memories" suggests the client's beloved Minnesota summer cabin with Lincoln Logs, vintage Playskool figures and a Fisher-Price kayak. Thanks for stopping by! If you would like more information on painting commissions, please contact Jennifer AT fatandappy DOT com. We also sell beautiful Giclee prints on canvas of Jonathan's work at fatandappy.com. Prices start at $99. Thanks for your blogging patience as Jonathan and I continue to crank out some special projects. I have discovered that I can't blog and work on my middle grade novel, Magical Raintree Daughters. I can do one or the other, but not both. Jonathan has finished his latest picture book and I'll give you a hint: it concerns the lowly chin. That's right, folks, we're all about the chin up in here. And what's this with unicorns, you say? Well, I have noticed that when Magical Raintree Daughters starts to bog down, I think of my eldest girl and I know she would be chomping at the bit to see more action. So, I think to myself, "Throw in a unicorn!" And then the story gets moving again. I haven't actually added a unicorn, yet, of course. But I have been writing in the equivalent. I should be done with the novel in about 5-7,000 words. It's challenging to pull it all together, but I am excited to end this particular story. Then, I'll take a break and start on Book Two, which will be about the oldest magical Raintree daughter, Penhally. Until then, here's a picture of our middle girl, reading away. We love books around here, we sure do. A Life at 3:42 p.m. This afternoon, my writing was done and the house slept quietly. I even had a dinner plan that would be pretty simple (pasta, parmesan, crumbled bacon with broiled asparagus). Feeling a little creative, I decided to take some shots with my Nikon that captured the suburban experience. No posing, no cleaning, no editing. Just fast shooting in about six minutes. (And Phoenix followed me upstairs, downstairs and outside, of course.) It's been about seven months since I quit my corporate social media job and I have happily and sometimes clumsily adjusted to the rhythms of my new role that puts me at the center of the home, where I long wanted to be: wife/mother/homekeeper/small business owner/creative writer. I've learned to embrace clutter (as long as I know it can be cleaned up! ); uncertainty; the joy of creekwalking in the middle of the day; multiple kid school and babysitter pick ups; and the unbridled excitement I have to be working on a novel again. Does this dog look like a menace to society ? Take a close look: Phoenix has systematically removed an eye from each stuffed animal. Diabolical! Our eldest girl carefully patched up her friends and then brought them to me for a group portrait. The shame, the shame. It seems a fruitless task, the sketching of our children, for how can I in anyway capture adequately the beauty of the child that sits or sleeps in front of me? So interesting, and against my perfectionist nature, to know that my attempts will be subpar at best. But in this realization there is a release of sorts: the usual pressure to perform subsides, for these sketches will not be masterpieces, but moments thrown down to revisit at a later date, tangible proof of a special point in time after so many other points are lost to life’s too-quick passing. This need to capture these moments is my challenge and motivation. There are the technical aspects of course. Twenty minutes, tops, is not really much time before the daughter in front of you asks once too often “Daddy, how much longer do I have to sit still?” and you realize creation is crossing into torture for both sitter and artist. The sleep sketches are even freer of predictability: five, perhaps ten minutes, the knowledge of a coming change pushing my pencil rapidly along. And then, the change made manifest with a snuffle and a roll, and deep sleep recovered in a different pose. But for these small swatches of time I get to look unabashedly at my children’s faces, studying, remembering, tucking away the geometry of their features. Features I now recall when they are at school, or I am on the road. Features I hope to still recall when they leave their mother and me and stretch toward the horizon of adulthood. As you who are parents well know, at the end of a hard day, full of sassiness and scuffles, whining and tantrums, there is a voice of despair that tells us we are underappreciated, that our failures outweigh the successes of our parenthood. Sketching my daughters is one of my releases from this voice, for as I study the peacefulness that attends their slack mouths and soft faces, I find in their letting go I am able to let go myself. Today’s slate is wiped clean. Tomorrow’s is as smooth and unlined as the calm brows of my lovely children. Here's an example of normal living with a kid (or three) life. We have two floor lamps from IKEA. The first was broken within 48 hours of arrival. The second? Smashed this summer. The pretty glass bowls were sturdy...just no match for children shoving them into the wall. Sigh. I am a big believer that children should respect the houses in which they live. Although every room is allowed in our house for play or reading, every room is not available for eating. That's the domain of the kitchen. Toys are put up each night so we can start fresh the next day. Jumping on furniture or ramming rolling toys into furniture is not permitted (but happens anyway). If a stain does pop up somewhere, the girls are helped in their task of cleaning it up. I spot clean our carpet immediately. I once knew a neighbor who allowed her carpet to get trashed by her two boys. She just shrugged it off as "Kids. Meh." Me? I don't have the money to rip up our carpeting (six years old and going strong) so stains are vanquished instantly. 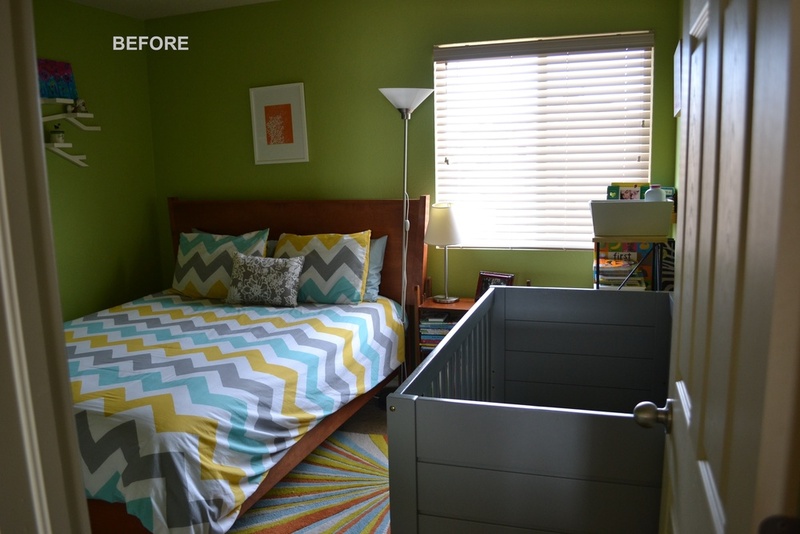 If you have children, you can also have a clean, artfully arranged home. I'm queen of budgeting, so I know it can be done on the cheap. Will your house be cluttered and toy-bedecked by the little darlings? Of course! But do they have to destroy it? Absolutely not. You deserve a lovely home, Mama. We did something new-to-us Saturday: we set up shop at the Bradburn farmers' market in Westminster, CO. Having a Fat and Appy table was a new experience, as was talking to other moms and dads about our modern art canvases. You see, I'm so used to looking at the canvases, thinking about the canvases, and working to share the canvases with the world, that it was a little strange to have to explain that, well, we sell modern art canvases. Most people thought they were looking at an original painting. That's a tribute to our trusted vendor who uses a Giclee method to print our canvases. The quality of the canvases is stunning. They look like original paintings. So, I found myself stumbling over the words a few times. I'll have to get smoother and less flustered. While we were at the market, we made new friends with Daniel and Kristen from the Early Bird Restaurant in Bradburn. I enjoyed their wonderful coffee and a delicious piece of banana bread. I love discovering new indie restaurants, and I know we'll come back and eat breakfast at their restaurant in downtown Bradburn. Big Idea was also at the market and they set up the best kids' creative activities. Our girls painted with foam and water for over an hour. They also decorated empty cardboard boxes. I loved the bustling nature of the market, the neighbors all stopping to chat and catch up, and of course, I loved the food. Jonathan read Guppy Up! to the kids at the market. This always cracks me up...kids really can say some hysterical things. 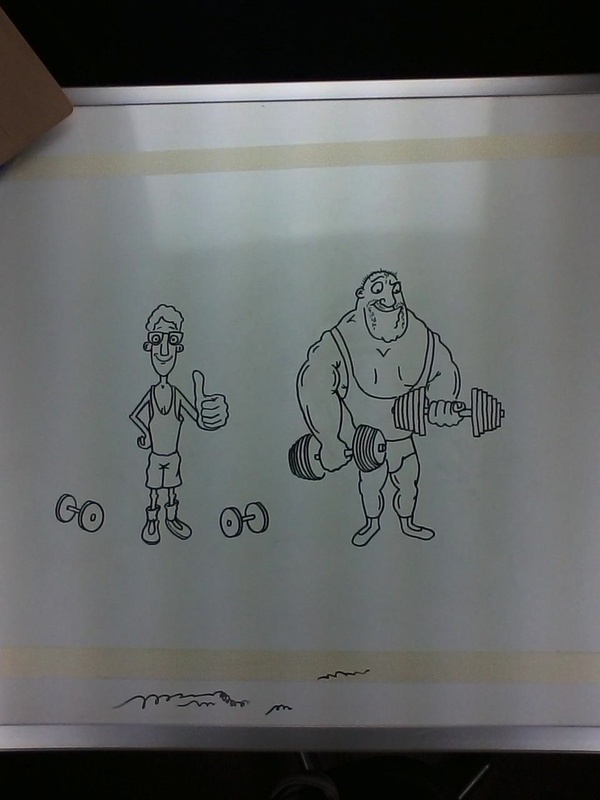 After he read, Jonathan drew his guppy character for the children and then they made their own versions. Going from "online" to real-time was definitely a first for our new business. Maybe we'll try art fairs or other festivals. I'm not sure yet. I like the convenience of selling online...the store is open while I'm asleep! But there's something to be said for talking with parents and hearing their feedback and what they want for their children's decor. I would like to find a way to balance both. Either way, banana bread must be involved. Welcome! We're Jennifer and Jonathan, and we make art, books, canvas prints and other fun things. Check out Fat and Appy to learn more. We are so glad you stopped by! Herewith is one of my most secret confessions: I so dislike sorting clothing from season to season for my children that I simply try to avoid doing it for as long as possible. This means the 7-year-old is bound to have a 5T tee shirt in the bottom of her drawer. I just cram the clothes in until the drawers finally threaten to go on strike. I don't want to remove too short shorts and the stained skirts because that would mean a trip to the basement corner where we store the girls' clothes in plastic tubs. And that basement corner, friends, is the Place of Memories. If I open a tub and gently fold in a stack of dresses and tees, that means I have to pull out a larger size for the same child. The too-small clothes, now being saved for another girl, remind me that the first child won't pass this way again. This clothes sorting crushes me. I get emotional, folding polka-dotted Hanna Anderssons and faded Circo skirts. I think to myself, like every parent who ever lived, "Where did the time go?" I know parenting by this point: its exhaustion, its ecstatic rewards. But putting away the soft, velvet dress your four-year-old wore at the Christmas Eve service where your family, along with your brother and his family, took up an entire pew? The night that was perfect and ended with the traditional singing of "Silent Night" and your four-year-old trembled as she held her first, "real fire" candle? How do you ever fold and store such a dress? So it was with some trepidation that I gathered our baby clothes, sizes 12 months and under, this week. We are done (unless God has other plans!) with having sweet babes. So, with a steely determination, I set up to sort and stack and fold the baby clothes. They would be off to another home, a young woman who is having her first baby and isn't starting out with much. As I filled the box with tiny, precious threads, the memories poured over me, sweet and gentle; lovely and humbling. I have been blessed to have held these babies, small and tiny. And as I worked, the emotions threatened to derail the offering I was trying to assemble. I blinked back tears and thought of new life. A new girl is to be born, perhaps her mother labors strong to bring her as I write this. And she, too, will outgrow these pretty clothes one day. And that's how I boxed up, cleaned up, and then restocked my youngest girl's wardrobe with her newest season of hand-me-down dresses, shorts and tees: by thinking past my babies to the baby that is to come. May she have a wonderful life, full of wonder, joy and love. Our story begins like all good tales do: with a mystery. What would await us at the millionaire's home? A little backstory: Three Thanksgivings ago, my brother and sister-in-law invited us to their house in Santa Fe for the holiday. We love visiting their very lively family which includes my three young nephews. There is always punishing physical activity to enjoy: hikes, skiiing, mountain biking; even one year, hula hooping. As we prepared to leave our Denver suburb, my brother Eric casually informed us by phone that he had found us a really great place to stay. We were intrigued because normally we would crash at his house (at that time, four of us plus dog). It turned out that Eric's wife had family who were leaving town for Thanksgiving but really wanted someone in their house to keep an eye on it. We would be that someone, and I was happy to help. Eric said only: "They have a really nice house. We don't bring the boys over." We followed the directions to a swanky area of Santa Fe and then turned into the drive of a lovely home. The houses in Santa Fe kind of run together in my head (adobe, adobe, blue gate, adobe) but I could tell this home was gorgeous and a cut above the rest. But it was when we walked inside that we did the jaw-drop thing. The house was a stunner. A huge, long gallery connected both wings of the house. The gallery was like an art museum with paintings, southwestern artifacts, indigenous instruments. We broke into an immediate sweat, glancing down at our two little wild-child girls (who were 3 and 1 at the time). The zebra-striped leather chair: off limits. The fragile glass vase on the coffee table: super off limits. The 100-year-old drum skinned with something priceless: so, so off-limits. The master bedroom was huge, spa-like and uber gorgeous. The two pre-teen girls rooms were fantastic and gave me ideas for our girls for the future. The garage floor was heated and painted. I couldn't figure out how to use the coffee maker. Our absent hosts thoughtfully left us the password for their Mac. All in all, it was a wonderful, pampering and out-of-this world experience. Miraculously, we broke nothing. Our second day there, we drove away from the house and spied something plopped on top of a neighbor's trash can. We're frugal people, so we did the usual double-take and discovered some swanky-type neighbor had thrown out a silver chandelier. Brakes applied, Jonathan got out and gave me the thumbs' up. The chandelier was dirty, but we could see it was very, very pretty. We decided to grab it, and none too soon, as a garbage truck rumbled down the street toward us. It's been almost three-and-a-half years and this week, we finally decided to hang the chandelier. I had almost forgotten what it looked like. When Jonathan got it out of the basement, I was dazzled. 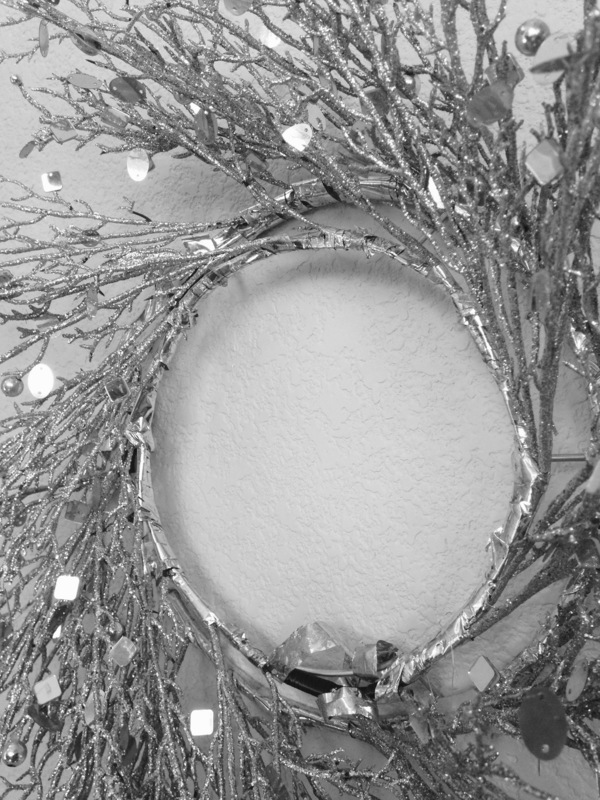 It's really, really lovely with curved arms, delicate-yet-strong decorative finishes and a luminous silver glow. Jonathan took it apart, rewired it, added a chain and the chandelier was ready to go. But first, we had to say goodbye to the chandelier that came with the house six years ago. Nothing against this light fixture, but it's not really our style. Then Jonathan spent a little time getting the new chandelier to hang just right. It reminds me of old Hollywood glamour. Kind of fun for our suburban home. The chandelier is really well made. The screws are straight screws and the UL tag looked very vintagey. Anyone know how old it might be? At our next house (someday, the Dream House! ), I want to hang this in our bedroom. It wouldn't work there now---there is no light installed in the ceiling and to do it retroactively would be kind of nuts (we've looked into it). And, so there you have it: a true tale of a chandelier destined for the trash heap but recycled into a certainly more humble abode. We love it, every sweet silver curve. Today is a windy day. I did not know wind until I moved out West. The wind here can blow and blow and somehow, you are supposed to function like normal. And our neighbor Wyoming to the north has it way worse. I took the middle girl to the new amazing Margaret Carpenter Park and Open Space today. I put on a brave face, but the wind was fierce and cold. My daughter asked if we could go after 45 minutes. Back in the house, I found Jonathan sketching a fun cartoon fox for the upcoming Westgate Community School 5K. He did the design for the inaugural run last year, too. I personally love foxes. I had an encounter with one years ago during an early morning hike in Yellowstone. The image of the silent, running fox has stayed with me. Jonathan was also working on Fat and Appy, our online shop for modern children's art. We've been adding the canvases in 3D, so you can see how the art will look. He just uploaded this cute Fisher Price car print. As always, thanks for stopping by! Come back tomorrow for the true tale of the Millionaire's Silver Chandelier. Intrigued? I hope so! We're Jennifer and Jonathan, and we make modern art for kids, in addition to some other projects. Subscribe to our blog at left, or sign up for our emails and receive 15% off of your next Fat and Appy purchase. Forget the perfume. Ditch the roses. For Valentine's Day this year, all you need is a pen and a pretty piece of paper. Your love letter doesn't have to be penned to a romantic partner. Write what's in your heart to your child, mother or father, best friend or simply someone special in your life. If you need a little nudge, I've written 5 pointers below. Go ahead...write a letter this year! Your loved one will always cherish it. Four times per year, Jonathan and I pen letters to each other (birthdays, our anniversary, Mother's/Father's Day and Christmas.) I love that our girls will inherit boxes of letters from their parents. As our oldest says now when she sees us kiss (with gentle disgust): "Smoochie! Smoochie!" This is a secret tip to writing a good love letter. Open your note telling your loved one why you wanted to write this letter. Dear Honey, I wanted to sit down and tell you a few things that are in my heart. Life is crazy right now. With the three girls, it seems like we're always making a peanut butter sandwich or scraping one off the ceiling. But even with our long days of chasing our art dreams while chasing down the girls, my heart still jumps when I see your face. Quite frankly, I'm in awe of your talent. I'm blown away by how you care for us. I am deeply, deeply thankful that you are the biggest part of my life. My home will always be with you. This week's contest winner is Jaymie from Snacks for Max! Thanks, Jaymie, for commenting! Please also check out Jaymie's blog for a really sweet review she wrote of Jonathan's easy reader Love Is in the Air. Last week, we also had a great post on Rochelle Melander's Write Now Coach blog (Jonathan guest blogged about his fave children's books). And Secrets and Sharing Soda did a beautiful review of Love Is in the Air. Hi friends! Jonathan and I are super happy to launch a new Friday freebie: we're giving away a hardcover copy of Love Is in the Air each Friday for five weeks. That's five chances to win! For today, please leave a comment telling us the answer to this question: Who will you read Love Is in the Air with? Want to know more about Love Is in the Air? Read this wonderful review by the children's book blog Sweet on Books. It's posted on their blog and also the NYC local ABC affiliate, WABC's website. I think the WABC link will only work for one week, so click today to see it! Melissa from Sweet on Books writes: "Love Is in the Air is a cheerful, heart-warming story; this is a subject not often found in "Learn to Read" books. This particular kind of children's book is deceptively hard to write, and write well. I don’t think that many authors even attempt it. So much of what is out there is just meh. But Jonathan Fenske has changed that." Thanks very much to Melissa and the folks at Sweet on Books. Stop in there for quality children's book recommendations, plus a gorgeously designed site that makes you want to stay around for a long time. They have an awesome rating system, plus you can sort recommendations by reader level which is very helpful. Good luck and get those entries in! We're just back from the library. A chicken psole cooks in the crockpot, courtesy of my sister-in-law who is visiting from Santa Fe. The house is full with six kids, 10 and under. To say things are in an uproar would be an understatement. But it's a good kind of chaos, the kind where adults carefully plan an outing to Which Wich, Starbucks and then to Anythink. I love Colorado. I don't think I've ever written that here, but it's true. For several years, we longed for the South, our home. But now, six years in, we are Coloradans. We have found the right neighborhood, school, church and we are blessed with more friends than we can carefully tend to. And then there's the beauty that is Colorado. In about an hour, we can be in Rocky Mountain National Park, flash our annual pass, and be off into the wild. Last month, before we were laid low with influenza, strep throat and pneumonia, we took visiting Fenskes to RMNP. Here are a few shots of the snow, the hike and the gorgeousness that is Colorado. Happy and blessed to be here.